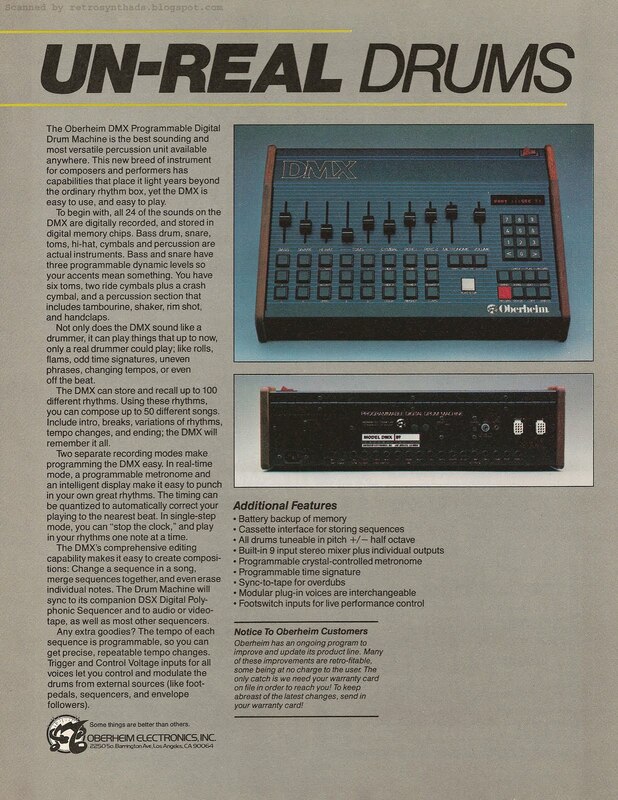 Oberheim DMX drum machine advertisement from page 43 of Keyboard Magazine April 1982. The DMX drum machine first started appearing in ads starting in mid-1981. The first was an ad that was designed to feature both it and the DSX sequencer, but could also be easily split apart to create two individual ads for each product. 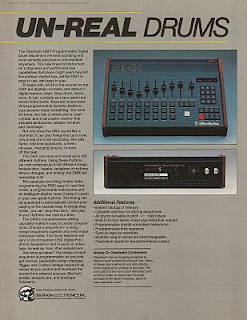 And Oberheim did just that a month or two later with the introduction of the DSX-only sequencer Xtra Hands ad. But, as far as I can tell, a DMX-only drum machine ad based on the same background/theme never materialized. It wasn't until three-quarters of a year later in early 1982 that this DMX-only ad started to run. It continued to run sporadically through the summer of 1982, taking turns to appear in Keyboard magazine with Oberheim's "The System" ad - an ad that featured the DMX as well as all the other members of the Oberheim family at the time. So, it makes sense that the Oberheim "System" ad and this DMX ad actually share quite a bit of design elements. In particular, the yellow-line design element, the grayish background colour (ugh - not a fan), and the relatively heavy ad-copy. In my opinion, those design elements don't really inspire the reader too much, and the rest of the ad elements don't add much to the mix either. For one, there isn't really a lot of balance to the ad - it almost looks like there is a right-hand column of text missing under the photos. And the colour photo images of the front and back panels are nice, but probably could have been larger and better placed had space been used more effectively. At least the ad-copy is interesting and provides quite a bit of reference information to the reader. But, I gotta say, there is a one-page LinnDrum ad appearing in the same issue that is black and white, features a very small photo, and includes only bullets of text. But I find I'm drawn to it more than this ad. I do like the title of the ad. It's a nice play on words about the technology used to create those fantastic drum sounds: UN-REAL DRUMS. But if there was one thing in particular I had to point out that bugged me about this ad when I first started looking at it, it's got to be that it doesn't mention 'The System'. My theory on 'The System' has always been that Oberheim was really trying to get in front of the possibility of the universal MIDI specs coming onto the scene in the near future. So, by repackaging their own proprietary tech as 'The System', they get a real head-start on MIDI. And since the DMX ad was running at the same time as that System ad, along with similar design elements, it would have made sense to also push 'The System' in any DMX ad. The ad does mention that the "drum machine will sync to it's companion DSX Digital Polyphonic Sequencer...". That's a start. But it's the rest of the sentence that gives away Oberheim's marketing approach. The sentence ends with "...and to audio or videotape, as well as most other sequencers". The DSX sequencer would do nothing for you if you bought it on it's own. It needed to have other gear connected to it to be of any use - either through that 37-pin computer connector, the CV/gates or the clock in/outs. This makes it much more "connected" with the "The System" than it's DMX brother. But a musician could easily use the DMX drum machine on its own. You can lay down tracks by itself, or, as this ad states - "sync to most other sequencers". Users could easily buy the drum machine on it's own, with no immediate need to pick up it's sister sequencer or synthesizer. So it makes sense to position the DMX in it's individual ad this way. And then in "System" ads, position as an integrated piece.